One more update on the Museum of Vancouver’s Petroglyph. 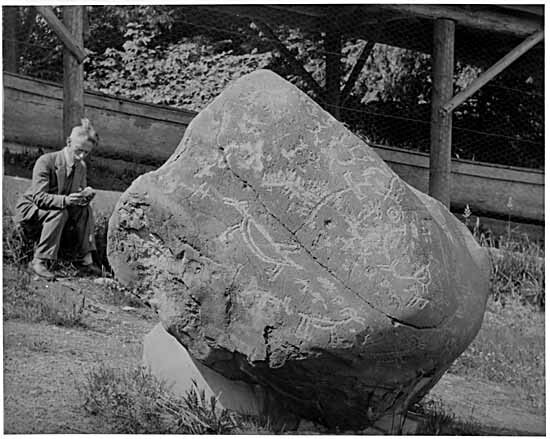 I have posted several times recently on a superb interior petroglyph boulder languishing in a shady courtyard at the Museum of Vancouver. Together with Heather Pringle’s posts on this topic, we seem to have caught the attention of the Board of Directors of the Museum. One of the Directors, Anthropology Professor Bruce Miller of UBC, called me the other day. He consented to me posting notes from our conversation. Professor Miller assured me the Board of Directors is very concerned indeed about the condition and disposition of this petroglyph. They are actively conducting research on it, including assigning a UBC Anthropology Ph.D. student to assemble information about it. They are looking into appropriate conservation measures (that requires professional conservators to evaluate the piece, which is an unusual conservation challenge). They will subsequently look into which First Nation or Nations claim ownership of this petroglyph and will enter into discussions as to appropriate treatment, including possible repatriation. Professor Miller also told me he would look into the text and appearance of this petroglyph on the MoV’s web. As George Nicholas suggests at Heather Pringle’s blog, the constellation of (sometimes competing) values associated with such a repatriation process are numerous and profound and I wish the MoV well as they move into this process. As ever, funding is a problem for museum work in this province. Cultural institutions, especially those programs which work with aboriginal heritage, are seriously underfunded and conservation and repatriation of a six ton boulder is expensive and logistically challenging. Consider also the likelihood of ceremonial costs likely to be associated with any repatriation – these would normally be borne by the institution. As I have said before, museums are defined by their people, and this situation demands professional attention from people, and it demands serious and sensitive cross-cultural relationships. Museums should not be warehouses for material culture, they should be communities of scholars dedicated to conservation and research and, thus, to education and interpretation. The expertise and diplomacy required by repatriation casts this fundamental aspect of museums into pretty sharp relief. So – a challenging prospect for the Museum of Vancouver and I welcome and believe the sincere expressions of pending action given me by Professor Miller. I really look forward to following this story as it unfolds. So many times it seems that what starts as a challenge, a road full of obstacles, can become a supremely rewarding outcome. Consider the full relationships that could be built with First Nations via the respectful dialogue around this work of art. I could imagine this difficult process being a national and international story which cast a very positive light on the Museum of Vancouver. I hope they find the money they need — certainly they have a preponderence of financial heavyweights on their Board of Directors. Part of a large boulder covered with detailed designs, these three animals appear to represent two dogs and a mountain sheep with spears or arrows protruding from the back and neck, indicating that this petroglyph may be an example of hunting magic. The schematic “stick figure” style of these carvings are dramatically different from the larger, more curvilinear petroglyphs found on the coast. This boulder was placed near the grave of Pauline Johnson in Vancouver’s Stanley Park for a time, but has since been moved again. It was originally located in the Fraser River canyon in the vicinity of Lone Cabin Creek. The photographs show a clean, moss-free boulder with the designs still moderately distinct but not as clear as they appear in the 1920s. Perhaps this was a priority for the Museum of Vancouver for some time, but until proven otherwise I’m going to chalk one up for Heather and myself. But sincerely, full credit to the MoV for starting a process leading to responsible conservation and disposition of this great work of art and expression of spiritual power. Full credit, and best of luck. Looking forward to what happens next. This entry was posted in anthropology, Archaeology, Cultural Resource Management, First Nations, history, Lower Mainland, Northwest Coast and tagged Cultural Resource Management, Museum of Vancouver, museums, petroglyphs, repatriation, rock art, Stl'atl'imx, Vancouver. Bookmark the permalink. It is great to see that something is going to be done about this. Dan Leen recorded the Borden number incorrectly, but thanks to the H.I. Smith reference in an earlier blog, it was possible to track the right number down, which is EhRn-4. “Originally found in the bed or the Fraser River halfway between Lone Cabin Creek and Crowes Bar Creek. Removed in 1926 to Stanley Park in Vancouver. Currently in the park, near Totem Poles in Brockton Point area. Plaque with boulder states only (incorrectly) that it came from Lone Cabin Creek. 2009: Moved in 1992 to a closed courtyard of the Vancouver Museum (from Stanley Park due to vandalism). 15-NOV-79,Sept 24, 1979: Tim Jones (CRARA) reported vandalism (graffiti) on boulder to provincial Archaeologist Bjorn Simonsen. Oct 22, 1979: Simonsen corresponded with Vancouver City Parks Board to have graffiti removed by RBCM Conservation Division (R. Beauchamp). Nov 2, 1979: I.R. Frew (Vancouver) reported that the graffiti had already been removed by Parks Staff as part of their policy of removing such immediately to discourage continued vandalism. Nov 15, 1979: Simonsen thanked them for doing this noting that he was glad the boulder wasn’t further damaged. Thanks, BC-Archaeologist. Interesting that it was vandalized while in Stanley Park. I can understand them bringing it indoors but wish they had brought it into a better context. Quentin — I actually have a picture of the Petroglyph Rock in situ. One of my hats is that of Stanley Park historian. I corresponded with Mary McDowell (nee Cross) who is the daughter of the chap who dug it out and was in charge of the effort to bring it to Vancouver. Well done Quentin and Vancouver Museum. Looks as if that UBC PhD student assigned to research this matter is going to have had most of their work done for them on your blog! heh, yeah — though what’d be most interesting will be if they initiate talks with the First Nations – presumably St’at’imc FN. I’d bet the removal of this petroglyph is close enough to recent memory for there still to be handed down accounts of the removal, etc. Thanks so much for bringing the boulder to our attention in the first place and then updating us on the situation. I will continue following this story with great interest. Hi Heather — high fives all around. I’ll be looking forward to see what steps the MoV takes, with every expectation this story is headed in a really fascinating and worthwhile direction now. Thanks for highlighting this issue (and thanks to Rudy for drawing my attention to your blog). I haven’t looked at the boulder for several years, but its condition may not be as bad as the photographs suggest. In the 1920s photo, the grooves have almost certainly been highlighted with chalk (common practice then, as now), making them appear much more distinct. Moreover, visibility of the grooves in photographs is highly dependent on lighting conditions, and the current location is not conducive to photography (or viewing for that matter). Nonetheless, the moss growth due to the damp, shady conditions is definitely not ideal for the boulder. On the other hand, there is less potential damage from freeze-thaw cycles in its current location. The first thing to do now is 3-D laser scanning. In any case, it is important that descendant communities are involved in any further actions, as you point out. In my mind, any decisions on conservation, relocation, or repatriation is their call. The original location of the petroglyph boulder is more or less on the “boundary” of St’at’imc and Secwepemc territories, so FN involvement and repatriation may be a bit complicated. I suspect the St’at’imc will consider this boulder as a boundary marker, although their self-published territory map shows its location to be north of the boundary. Probably the most important next step would be to bring together a council of St’at’imc and Secwepemc Elders to view the boulder and discuss potential options. I will be keen on following this issue… not the least because SFU also has a bunch of petroglyph boulders in its collection that the St’at’imc hope to repatriate some day. I am going to dispute the chalk idea. The picture in question seems to be a snapshot, rather than a “lets document this art” moment. Chalk is very a flat and opaque medium and the picture appears to be mottled and granular. And the pecked areas appear similar within the pictures to what appears to be recent spalling around the base, probably from moving the boulder as Morley suggests elsewhere. I think it is entirely likely that the high visibility was due to pecking away a weathering rind producing a petroglyph which was both in relief and a colour contrast. Such petroglyphs are well known, even in East Sooke and near Port Hardy on the coast here. Anyway, whoever is looking into this could do worse than look at the whole Phil Timms photo archive to see if he took more of this boulder which are not online. And, I am glad momentum is building for action on this boulder. I know it won’t be easy and might even be fractious but my prediction is it will be a positive outcome and is certainly the right thing to do. So, win all around. Mile Steele (comment a bit above) – belated thanks for posting here. That’s great to know there is a picture of the boulder prior to it being relocated to the lower mainland. I know there has been movement of this project since I posted this some time back, but I don’t know what the current state of affairs is – e.g., will it be repatriated; will it go back to the banks of the creek? If anyone cares to update this with a comment, I’d welcome that. Or, if there is something to which I can link and which would form a new post, even better. The readers of this blog may be interested in the most recent news regarding what you refer to here as the petroglyph boulder. The boulder will be repatriated on June 12 and 13 to Stswecem’c Xgat’tem First Nation (formerly Canoe Creek Indian Band) and ceremonies marking the occasion will take place at the museum and after the trip home. Chief Hank Adam will preside. This will be the end product of a lot of work by museum professional staff, headed by Joan Seidl, UBC anthropology PhD student Emily Birky, and Chris Arnett, author, and PhD student at UBC. The director of the museum, Nancy Noble, Emily Birky, Joan Seidl, and I traveled to Clinton, BC, last year to meet Chief Adam and other band members and to visit the boulder’s original location along the Fraser River. This kind of success is dependent on establishing good relations between community and museum. But there is more. When I joined the Board of the museum several years ago there was no repatriation policy and return of the boulder and other items has been on the top of my agenda. A repatriation policy was created and, eventually, accepted by the City legal staff. The museum has now carried out significant repatriations of a Maori cloak, the Sechelt Image (known by Sechelt as Our Grieving Mother) to the Tems Swiya Museum of the Sechelt Nation, and human remains to several bands. Museums, perhaps more than ever, need the input of social-cultural anthropologists and archaeologists. We should take note of the precarious financial position of Canadian museums. Staff are overworked and need support in repatriation and other activities with First Nations.